…the way I see it, ASUU and the students and the frustrated parents are all collective victims of the tragic and colossal failure of leadership in Nigeria. This point is not limited to the current irresponsible administration of President Buhari. The one before and the one before and the one before this administration were all equally irresponsible. I don’t know. There are too many warring emotions in me about this subject: the crisis in Nigeria’s higher education. After all, the tragedy of the Nigerian University system is why I nearly lost my life is why my left leg was nearly amputated is why my right hand was nearly amputated is why I still have a slight limp is why I am still in therapy! Strange-winding musical sentence? I know. I am a writer. I am allowed to perform orthopedic surgery on English syntax to paint the colour of my intense feelings; of the intensely personal dimension of this ongoing strike by the Academic Staff Union of Universities for me. It is personal because I nearly died but those directly responsible for this comatose situation are still in office. In fact, they are campaigning because it is political season. The education of Nigeria’s children is a secondary issue. In fact, students being away from classes is a boon! More idle social media warriors for politicians whose children are studying for exams here abroad! So, every new day is another ordinary, normal day for oppressor and victim. But I refuse to be part of this culture of normalcy. Even if the owner of the head says nothing spoil, I will be the lone busybody bearing the pain of the headache he says he doesn’t have. I am not going to accept like the rest of Nigeria that a single day of University closure, because of a strike, is just another normal day in the life of the country. An ASUU strike that has already claimed the lives of eleven students – and that is what we know o – is just part of a culture of national insouciance: the minister of education is still in office; all the policy makers in Nigeria’s higher education sector are still in office. The whole country is shrugging and behaving like nothing spoil. No, I cannot accept that reality. We cannot all collectively lose the capacity to say: it ain’t right. I said this is personal because intervention to contribute my bit part to the Nigerian University system nearly cost me my life this year. 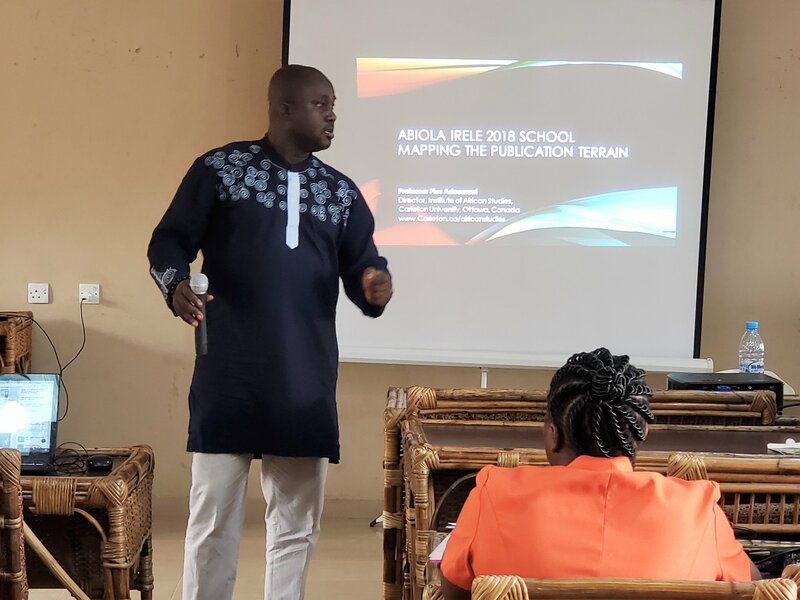 For nearly a decade now, my point of intervention in African higher education has been the training and mentoring of the next generation of African scholars and researchers. The training and mentorship of African PhDs, postdocs, early-career, and mid-career University lecturers has become almost a missionary calling for me. That is why you see me junketing across Africa every summer from Ghana to Nigeria to South Africa via Kenya. I work with international stakeholders and local Universities in various training programmes for junior and mid-career lecturers and researchers. With specific reference to Nigeria, my point of departure is that we cannot continue to complain about the abysmal quality of our undergraduate students if we don’t invest in the training of the lecturers who teach them. Where there are willing vice chancellors, we can take the training that junior and mid-career colleagues would normally come to acquire abroad to them in Nigeria. Professor Abdulrasheed Na’Allah, vice chancellor of Kwara State University, is one such visionary vice chancellor who enabled Professor Adeleke Adeeko of the Ohio State University and I to design a platform for the annual training of lecturers in his school and in the Kwara State catchment area: the Abiola Irele School of Theory and Criticism was born in 2015. Professor Adeeko and I were given KWASU professorships and appointed director and deputy director of the School respectively. And so, every year since 2015, we have headed out to Ilorin to train these lecturers in intensive seminars covering a wide range of research and theoretical competencies: publications, grants, interdisciplinary research in the humanities and the social sciences, how to better supervise undergraduate long essays, enhancing your skills in supervising post-graduate students, broadening your bases in the global knowledge economy. Every year, KWASU assembles about 40 lecturers to take these seminars. Unilorin lecturers join. Lecturers from private universities in the environ register. Polytechnic and Colleges of Education lecturers sign up. We teach for three weeks and bond with these energetic colleagues. The photos in this essay are from this year’s seminars back in July. In fact, they are from my last day of teaching in Ilorin. As soon as I finished teaching the class you see in these pictures, I bade farewell to everyone because I needed to head out to Lagos to catch a flight to Dakar that evening for a consultative meeting convened by the African Union. Well, I never made it to Lagos, let alone Dakar. I had a horrific car crash between Ogbomoso and Oyo. I had no other business in Nigeria than to help the lecturers who teach your children. I am familiar with all the arguments for and against ASUU. I know all the frustration. I know that after nearly three uninterrupted decades of this annual ritual of multiple strikes, the utility of strikes as a productive praxis is now being called to question. However, the way I see it, ASUU and the students and the frustrated parents are all collective victims of the tragic and colossal failure of leadership in Nigeria. This point is not limited to the current irresponsible administration of President Buhari. The one before and the one before and the one before this administration were all equally irresponsible. The point is: the 21st century pedagogical and epistemological skills that we go to disseminate in our seminars require certain enabling conditions for the lecturers to transmit them to their own students. Those conditions are never there. I am very sympathetic to our colleagues because in these seminars, I spend three weeks bonding with them and listening to horror stories of the conditions in which they have to deliver. There are times when those of us who go to train lecturers at the aforementioned programme at Kwara State University feel like Catholic priests listening to confessions of horror. Yes, we encourage innovation, initiative, and resourcefulness in the context of the benumbing strictures in which they work. We actually design practical seminars in how to stay networked with international research communities, despite the limitations of their contexts (I am particularly proud of a lecturer who won a US$30,000 research grant from an American funder two years ago because I encouraged her to prepare the entire application on her phone when she complained that her computer had broken down, no light, no this, no that). We teach that contextual strictures are no excuse for lack of productivity in this age of the democratisation of knowledge. However, we cannot expect colleagues to mistake palliatives for the solution and not to put pressure on those singularly responsible for the situation: the country’s leadership. If I were a professor in the Nigerian system, I’d be on strike too to press home only one demand: the children of ordinary Nigerians in Nigerian Universities deserve to be educated in the conditions that Nigeria’s irresponsible leaders send their children to enjoy in the University campuses of Euro-America. I salute the courage of Nigerian lecturers! I salute the resilience of Nigerian students! I salute the patience of long-suffering Nigerian parents! Pox on the leaders of Nigeria and their generations!